Analysis Services provides metrics to help you monitor the performance and health of your servers. For example, monitor memory and CPU usage, number of client connections, and query resource consumption. Analysis Services uses the same monitoring framework as most other Azure services. To learn more, see Metrics in Microsoft Azure. 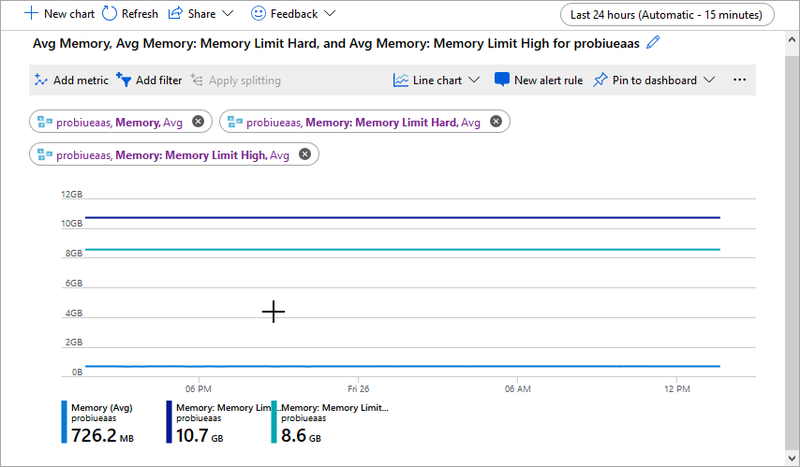 To perform more in-depth diagnostics, track performance, and identify trends across multiple service resources in a resource group or subscription, use Azure Monitor. Azure Monitor (service) may result in a billable service. 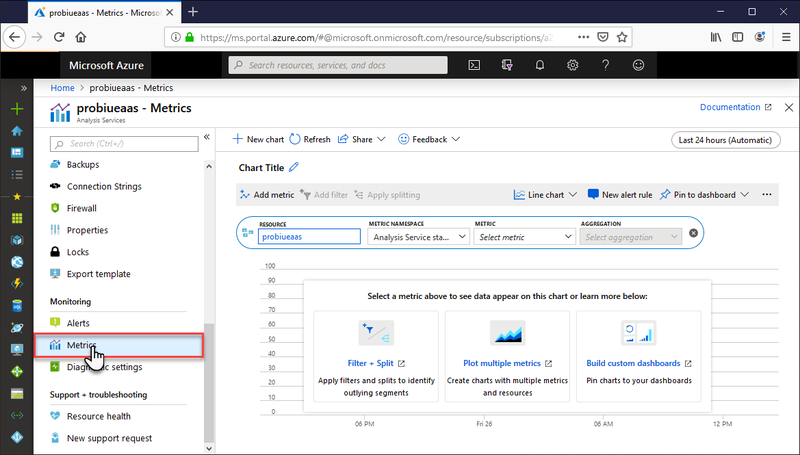 In Azure portal, select Metrics. In Available metrics, select the metrics to include in your chart. Use this table to determine which metrics are best for your monitoring scenario. Only metrics of the same unit can be shown on the same chart. CommandPoolJobQueueLength Command Pool Job Queue Length Count Average Number of jobs in the queue of the command thread pool. CurrentConnections Connection: Current connections Count Average Current number of client connections established. CurrentUserSessions Current User Sessions Count Average Current number of user sessions established. memory_thrashing_metric Memory Thrashing Percent Average Average memory thrashing. CleanerCurrentPrice Memory: Cleaner Current Price Count Average Current price of memory, $/byte/time, normalized to 1000. CleanerMemoryNonshrinkable Memory: Cleaner Memory nonshrinkable Bytes Average Amount of memory, in bytes, not subject to purging by the background cleaner. CleanerMemoryShrinkable Memory: Cleaner Memory shrinkable Bytes Average Amount of memory, in bytes, subject to purging by the background cleaner. MemoryLimitHard Memory: Memory Limit Hard Bytes Average Hard memory limit, from configuration file. MemoryLimitHigh Memory: Memory Limit High Bytes Average High memory limit, from configuration file. MemoryLimitLow Memory: Memory Limit Low Bytes Average Low memory limit, from configuration file. MemoryLimitVertiPaq Memory: Memory Limit VertiPaq Bytes Average In-memory limit, from configuration file. MemoryUsage Memory: Memory Usage Bytes Average Memory usage of the server process as used in calculating cleaner memory price. Equal to counter Process\PrivateBytes plus the size of memory-mapped data, ignoring any memory, which was mapped or allocated by the in-memory analytics engine (VertiPaq) in excess of the engine Memory Limit. Quota Memory: Quota Bytes Average Current memory quota, in bytes. Memory quota is also known as a memory grant or memory reservation. QuotaBlocked Memory: Quota Blocked Count Average Current number of quota requests that are blocked until other memory quotas are freed. VertiPaqNonpaged Memory: VertiPaq Nonpaged Bytes Average Bytes of memory locked in the working set for use by the in-memory engine. VertiPaqPaged Memory: VertiPaq Paged Bytes Average Bytes of paged memory in use for in-memory data. ProcessingPoolJobQueueLength Processing Pool Job Queue Length Count Average Number of non-I/O jobs in the queue of the processing thread pool. RowsConvertedPerSec Processing: Rows converted per sec CountPerSecond Average Rate of rows converted during processing. RowsReadPerSec Processing: Rows read per sec CountPerSecond Average Rate of rows read from all relational databases. RowsWrittenPerSec Processing: Rows written per sec CountPerSecond Average Rate of rows written during processing. QueryPoolBusyThreads Query Pool Busy Threads Count Average Number of busy threads in the query thread pool. SuccessfullConnectionsPerSec Successful Connections Per Sec CountPerSecond Average Rate of successful connection completions. CommandPoolBusyThreads Threads: Command pool busy threads Count Average Number of busy threads in the command thread pool. CommandPoolIdleThreads Threads: Command pool idle threads Count Average Number of idle threads in the command thread pool. LongParsingBusyThreads Threads: Long parsing busy threads Count Average Number of busy threads in the long parsing thread pool. LongParsingIdleThreads Threads: Long parsing idle threads Count Average Number of idle threads in the long parsing thread pool. LongParsingJobQueueLength Threads: Long parsing job queue length Count Average Number of jobs in the queue of the long parsing thread pool. ProcessingPoolIOJobQueueLength Threads: Processing pool I/O job queue length Count Average Number of I/O jobs in the queue of the processing thread pool. ProcessingPoolBusyIOJobThreads Threads: Processing pool busy I/O job threads Count Average Number of threads running I/O jobs in the processing thread pool. ProcessingPoolBusyNonIOThreads Threads: Processing pool busy non-I/O threads Count Average Number of threads running non-I/O jobs in the processing thread pool. ProcessingPoolIdleIOJobThreads Threads: Processing pool idle I/O job threads Count Average Number of idle threads for I/O jobs in the processing thread pool. ProcessingPoolIdleNonIOThreads Threads: Processing pool idle non-I/O threads Count Average Number of idle threads in the processing thread pool dedicated to non-I/O jobs. QueryPoolIdleThreads Threads: Query pool idle threads Count Average Number of idle threads for I/O jobs in the processing thread pool. QueryPoolJobQueueLength Threads: Query pool job queue length Count Average Number of jobs in the queue of the query thread pool. ShortParsingBusyThreads Threads: Short parsing busy threads Count Average Number of busy threads in the short parsing thread pool. ShortParsingIdleThreads Threads: Short parsing idle threads Count Average Number of idle threads in the short parsing thread pool. ShortParsingJobQueueLength Threads: Short parsing job queue length Count Average Number of jobs in the queue of the short parsing thread pool. TotalConnectionFailures Total Connection Failures Count Average Total failed connection attempts. TotalConnectionRequests Total Connection Requests Count Average Total connection requests.